Motorcyclists face ever-present risks. The roads are rough and many treacherous obstacles can be found throughout the Inland Empire – whether you’re driving through Riverside or Moreno Valley, Temecula or Rancho Cucamonga. According to the National Highway Traffic Safety Administration (NHTSA), 5% of all yearly highway fatalities involve motorcycles, even though only 2% of all registered motor vehicles are motorcycles. This increased risk of injury is due to the increased exposure that riders face form other drivers and truckers. Abrasions and Road Rash: The best way to reduce the risk of road rash or abrasions in a motorcycle accident is to wear the proper protective outerwear. However, if you are not properly protected, you can suffer severe injuries as your skin comes in contact with the ground. A road rash entails the removal of the outer skin layers, sometimes so significantly that the inner tissues are exposed. As such, it is important to seek medical attention when you have road rash. A medical professional can evaluate your condition to make sure you receive proper treatment, if required. Fractures: In severe collisions, motorcyclists can suffer bone fractures and breaks. It is vital that you seek immediate medical attention in this situation. The most common type of fracture that results from a motorcycle collision is a broken leg, as it is common for legs to become trapped under motorcycles during an accident. There are other common bone fractures as well (such as wrist fractures, hand fractures and arm fractures) that result from a rider’s instinctive attempt to break their fall when their motorcycle tips. Although protective outwear is capable of protecting against road rash, a bone fracture can still occur in a more severe collision. Traumatic Brain Injury: TBI can also occur as a result of a motorcycle accident, this type of injury is more common that you may think. Blunt force trauma can cause a severe injury to a rider’s head, causing irreparable damage with life-altering ramifications. Most motorcycle injuries tend to be relatively minor, but traumatic brain injuries and severe head traumas can still occur. The risk is reduced when riders wear helmets. However, even wearing a helmet does not guarantee that a motorcycle rider will be safe from a serious head injury during a motorcycle accident. 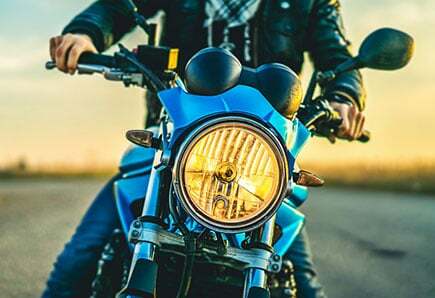 If you’ve been involved in a motorcycle accident, there are many factors to consider when filing your insurance claim, including whether or not you’ve sustained any injuries. Hiring a motorcycle accident attorney who you can consult with, who can advocate for you, and who can answer all the legal questions and concerns will play an important role in the success of your claim. Simply call Inland Empire Motorcycle Law at (951) 290-3664 today to find out what it means to hire an attorney who is also a licensed motorcycle rider and,- someone who is as passionate about cycling as you are.